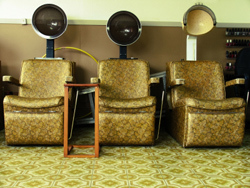 A requiem for the beauty parlor. I knew something was in the air when the local hair salon started calling itself a day spa. Now all the blue-haired old ladies in town are going to be able to get a Brazilian wax. When I was growing up, my mother used to go twice a month to the beauty parlor. That was what it was called then — not the hair stylist or even the hair salon, all latter-day terms. She would have her hair cut, colored, or coiffed, and sometimes she would get a manicure. But hair and nails were the extent of it. The body that lay in between was off limits. Caring for that — whatever it might entail — happened in the privacy of the home.